Data has always been the most important part of any mobile application. Developers need to store substantial amounts of data in an organized fashion in order for their apps to be truly valuable to their users. In Android, you can store your data using quite a few different methods, both in active memory and in written files. Many apps also have a remote web service that provide the data for the app in question. Android also supports data storage in a local database, and the operating system provides a good infrastructure for storing and retrieving data. In most cases, the most simple and straightforward way to acquire and preserve user data is via SQLite databases. Name – The name of the new database file. Version – The version of the database. This number is used to identify if there is an upgrade or downgrade of the database. This method is called when we create the database. It is passed the SQLiteDatabase reference, which we can use to perform various operations on the database. In this method, we use the function execSQL to execute an SQL query to create a table called “friends,” which has three columns. The first column, (_id) is required to generate a unique id for each column. This is necessary in case you are going to use classes like SimpleCursorAdapter (more on this later in the article). The second and third columns (name and phone number) are the data fields that we actually want to store. This method is called whenever the database is upgraded. In this method, SQLiteDatabase and the oldVersion number and newVersion number are passed. In this function, we simply drop the “friends” table if it exists and create a new one, but there could be more complex logic based on the tables you are creating in the database and what you would want to happen on an upgrade. In class MyDatabaseHelper below, we will write a function to insert values into the database. In this function, we take the input arguments as the name and the phonenumber. Then, we create a new object of ContentValues, we put the values for name and phonenumber within that new object. Once we have done that, we get the SQLiteDatabase reference for writing using the function getWritableDatabase, which is a member of SQLiteOpenHelper. Once we have the reference of the SQLiteDatabase, we call the insert function, which takes the arguments as the table name, one of the columns of the table, and the ContentValues. This will enter a new row in your friends database table. Here in our activity, we create a new object (MyDatabaseHelper) and then add some values in the table by calling the function addFriend. Once we have added the data into the database, we will now see how the data can be retrieved. To retrieve the data, there are two possible methods. We can directly run an SQL query like SELECTto retrieve the records from the database. We can also run queries on the database using the function query on the SQLiteDatabase. The query function lets you query on one table and also specify some selection and ordering criteria. The query function takes several arguments: the name of the table, the name of the columns of the table to retrieve, the selection criteria, the arguments for selection criteria, the group by clause, the having clause, the order by clause, and the limit. The result of a query is returned in form of a Cursor object, which basically helps by caching the result of the query in an efficient way and providing functions to access the data. The cursor has functions such as moveToFirst, which moves the cursor to the first record, moveToNext, which moves the cursor to the next record, and isAfterLast, which checks if the Cursor has moved passed the last record. The cursor also has functions like getInt, getString, etc., which take the index of the column and return the value. Using Cursor Adapter to Display Data Values. 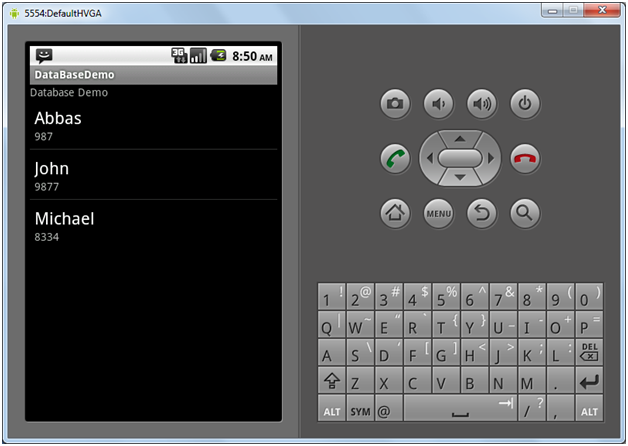 Once we do this, the list of friends will appear on the Android device as shown below. Data is the most important part of today’s competitive apps. A well-built app must store and retrieve data efficiently and with ease, so that it can function smoothly and please users. Android provides several forms of good support to store data in databases for your Android apps. It provides all the functionality to create and update SQLite databases and database tables. Make sure to make the most of it when designing your next Android app!